It’s that time of year again. The kids are back in school, the air has turned crisp, and colds and flus are becoming our friends—or enemies—once again. We all know the common advice about washing your hands, covering your cough, and avoiding sick people, but there are some other things we can do to try to keep our kids who are medically complex a little healthier this season. The American Academy of Pediatrics, along with most major medical groups, advises that every child over the age of 6 months receives a Flu shot. This is even more critically important for children with special needs, who have the highest risk of death or complications from the Flu among children. The ideal time to receive a Flu shot is about a month before Flu season is expected to hit your region. Try watching the CDC’s Flu Surveillance page to see when Flu is beginning to become prominent in your area. If you vaccinate too early, you run the risk of the vaccine immunity “running out” before the end of Flu season. But if you wait too long, you may not be able to build enough immunity against the Flu before it hits your region. 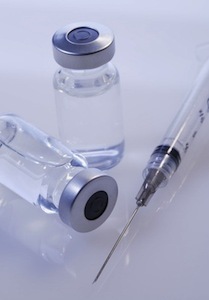 Some children with complex medical needs have problems with vaccines and vaccine reactions. Please see this previous article on giving the Flu shot to children with medical conditions or vaccine reactions. No matter what, make sure your child receives the inactivated form of the vaccine that is given as a shot, and not the Live Attenuated (LAIV) nasal spray version (FluMist). It is also important to note that a recent article about the Flu from the journal Pediatrics showed that 336 children died during the 2009 Flu season, and 68% of these (227 children) had an underlying medical condition. Of those who had an underlying medical condition, two-thirds of the children had a neurological condition such as cerebral palsy or epilepsy. Virtually all of the children who died were unvaccinated, mostly because a vaccine for the strain seen in 2009 was not available yet. While it is not always possible for scientists to accurately predict which strains need to be included in the vaccine, Flu shots remain the single best defense against Flu and its complications. Children who have respiratory problems or impaired immune systems or immune responses should also consider getting vaccinated for the bacterium Strep. Pneumoniae. Many of the children who die from the Flu actually die from pneumonia or sepsis caused by secondary infection during the Flu illness, and one of the most common causes is Strep. Pneumoniae. Some of these infections may be prevented through vaccination. Most children receive the Prevnar series, which prevents Strep. Pneumoniae, as young children. Some children, however, lose their protection against this bacterium and need a booster shot. In addition, the shot typically given to older children who are medically complex, Pneumovax, contains protection against 23 strains, many of which are not included in the Prevnar series. If you are unsure whether or not your child should receive a Pneumovax vaccination, your doctor can check your child’s blood levels for antibodies against Strep. Pneumoniae. If your child gets the Flu even after taking precautions, complications can be prevented. The most important thing you can do is get your child diagnosed with the Flu as soon as possible, so that treatment can begin early in the course of the Flu. Anytime you suspect your child may have the Flu or if he has been exposed to the Flu by a sibling or friend, he should be taken in to get a diagnostic Flu swab. While seeing your child’s physician is ideal, this test can also be performed at urgent care centers and retail-based clinics. This quick and easy test is not perfect, but it can help you make treatment decisions. If your child tests positive for the Flu, he should begin a course of antivirals as soon as possible, preferably within 48 hours of first symptoms. Most types of Flu circulating now are sensitive to both Oseltamivir (Tamiﬂu) and Zanamivir (Relenza). Your entire family may be treated if other family members also have the Flu, as reducing Flu severity in all family members can help your child who is medically complex avoid certain complications. Most children who are hospitalized or die from the Flu usually have secondary infections, most commonly pneumonia. It is critically important, therefore, that any child with a susceptibility to pneumonia or respiratory compromise receives aggressive pulmonary treatment with the Flu. While this may vary from child to child, in general children with neuromuscular weakness or respiratory conditions should receive assistance to clear secretions from their airways. This is typically accomplished using chest physical therapy, high frequency chest wall oscillation vests (SmartVest and the Vest), cough assist devices, or intrapulmonary percussive ventilation. Frequent suctioning of the mouth, nose, and trachea may be helpful, using a suction machine or bulb syringe. Even children without a history of respiratory compromise may benefit from chest physical therapy, which can be easily learned and performed with no specialized equipment. Children who are having difficulty breathing, clearing their secretions, or coughing should be evaluated by medical professionals. While some may need simple treatments such an antibiotics or nebulized medication, others may need to be hospitalized to receive appropriate therapies. The Flu has been particularly challenging the past few years, with the H1N1 strain in 2009-10 appearing unexpectedly and during an unusual time of the year. In 2010-11 the Flu season was quite mild, while many children got the Flu in 2011-12 despite having the vaccine. It is unknown what this year’s flu season will bring. The most important thing a parent can do is to be prepared in advance for Flu season through vaccination, and to be vigilant of Flu trends and symptoms. A child can only be treated for Flu if a parent is able to identify the symptoms and bring the child in to see a physician for diagnosis and treatment. A sudden fever, tiredness, body aches, chills, and a sudden-onset cough are all signs of the Flu. Children may also have diarrhea or vomiting. If you suspect Flu, seek immediate medical attention. It might just save your child’s life.